reportedly injuring some 300 people. 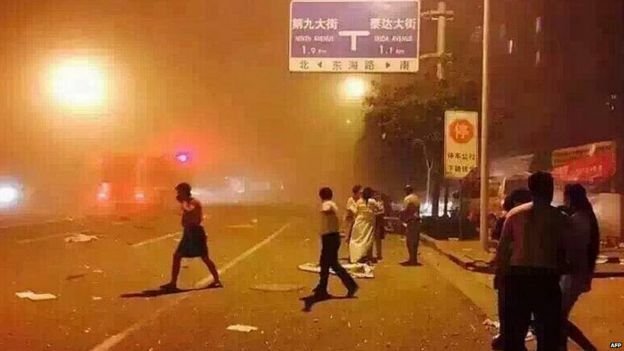 According to Chinese state media, the blasts occurred when a shipment of explosives blew up in the port city at about 23:30 (16:30 GMT). Pictures and video shared on social media showed flames lighting up the sky and damage to nearby buildings. 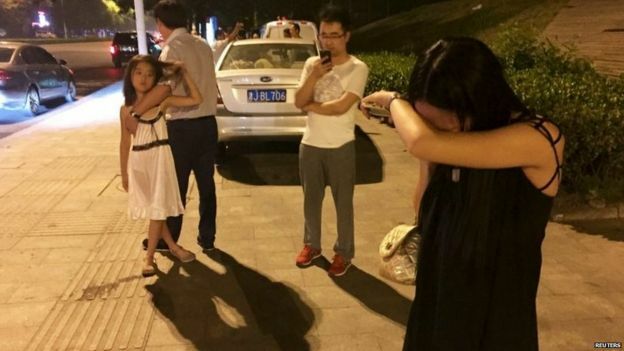 Shockwaves could apparently be felt several kilometres away from Tianjin. 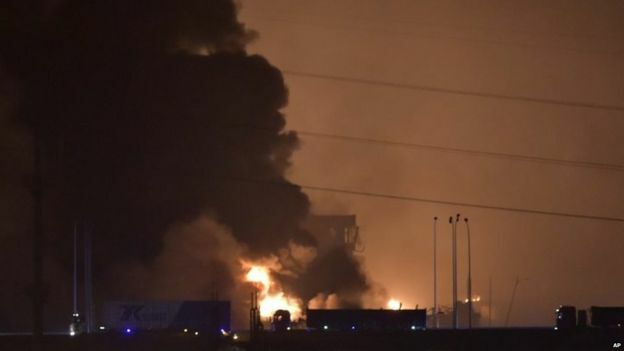 The editor of the BBC's Chinese Service, Raymond Li, says all indications are that it is an industrial accident. The first explosion was followed by another 30 seconds later. An official Chinese seismic agency said the force of the first explosion was equivalent to three tons of TNT, the second was 21 tons. 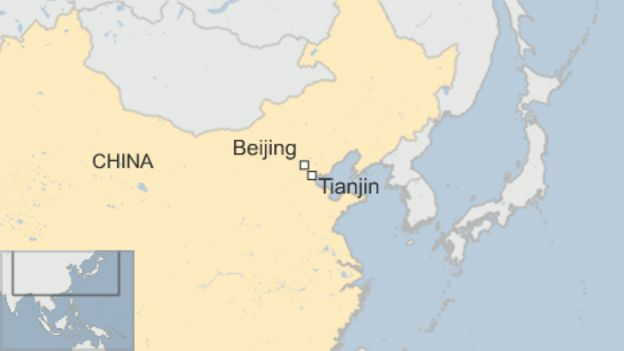 Further blasts were subsequently triggered nearby, Xinhua state news agency said. Some of the still photographs being posted online really give a sense of the damage. People are showing internal doors ripped off their hinges and glass is scattered everywhere inside apartments. The most upsetting images are from the surrounding streets and from hospital waiting areas showing some of the injured - parents carrying injured children. Hospitals are clearly struggling to cope with this huge influx of casualties. 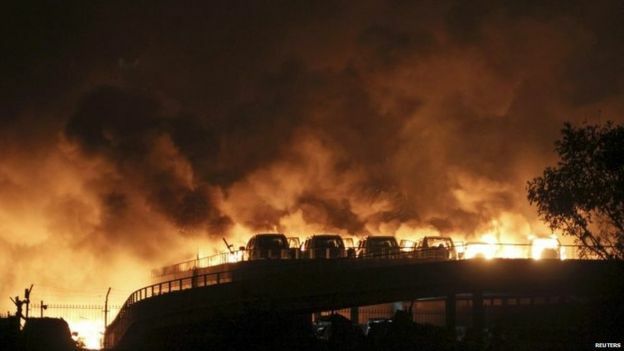 Hours later, fires were still burning and 100 fire engines were at the scene, reported Chinese state broadcaster CCTV. It added that police were focusing on search and rescue operations rather than putting out the fire, as they want all chemicals to burn up completely. There was concern that high winds in the area could cause yet another blast. Two firefighters were "out of contact", and four were among the injured, Xinhua said. 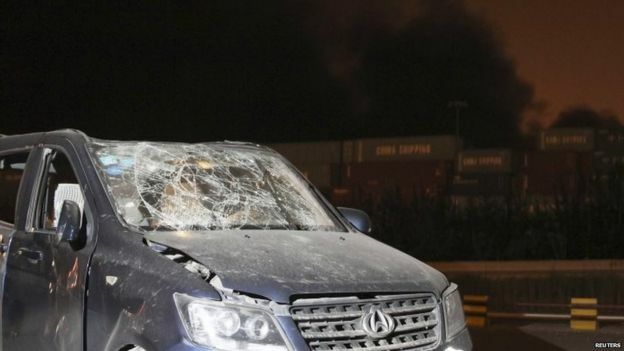 "At the time of the explosion the ground was shaking fiercely, nearby cars and buildings were shaking, a few buildings' glass all broke and everyone started to run," she said. Several tower blocks near the port area are without power, CCTV said. 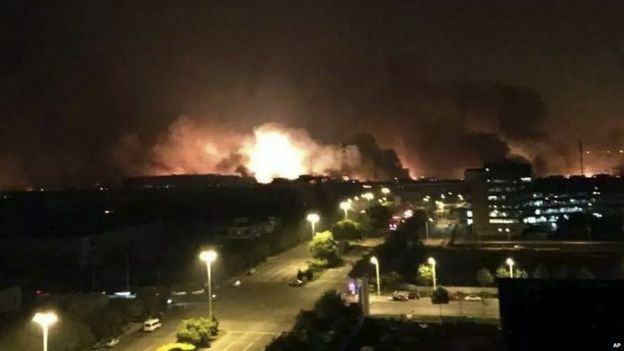 The blasts took place in a warehouse area storing dangerous goods in Tianjin's Binhai development zone, Xinhua said. You can share this story by emailing ( tanehnazan.com / Facebook tanehnazan.com ) .